Garrett County Government is committed to expanding rural broadband connectivity to its citizens and businesses throughout the county. To learn more about our broadband efforts, visit our Press page. Our county has worked for years to connect our critical infrastructure (schools, hospital, county services, etc.) The county then started working on broader broadband issues, targeting business, organization and residential access. A feasibility study was completed in 2012. 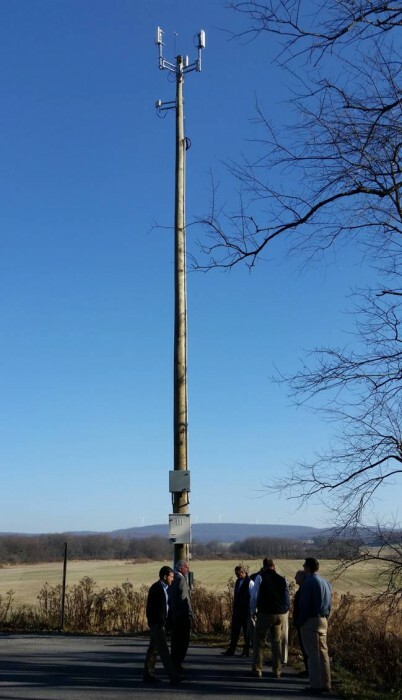 The study concluded that a public-private partnership using fixed wireless technology (TV White Space (TVWS) and other unlicensed spectrum) is the best solution for the rugged, remote areas of Garrett County. Through three phases of Appalachian Regional Commission (ARC) grants matched with county funds, six targeted unserved and underserved areas in three regions of the county are served with fixed wireless broadband internet connectivity. The county's private partner, Declaration Networks Group (DNG), is actively deploying the network in all three targeted areas as well as expanding beyond the ARC project target areas to other unserved areas. This includes installing wooden poles (see photo) in strategic locations to transmit wireless signals to homes and businesses. The county's engineering and business consultant is CTC Technology and Energy. Currently over 600 homes and businesses are receiving service through the fixed wireless project. DNG finalized the deployment in all three targeted areas. Deployment continues across the county. NeuBeamTM, DNG's brand name for their product, is the local provider of service for the fixed wireless project. Some residents and businesses may have already received information from Neubeam about purchasing service. For further information, click here. The County's Private Partner, Declaration Networks Group (DNG), has secured additional funding through both a grant and loan the USDA Rural Utilities Service to serve additional unserved areas of Garrett County.